Posted on November 13, 2018 at 11:05 pm. 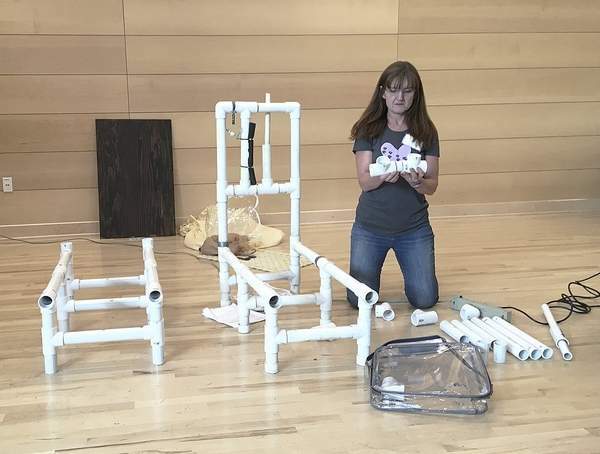 PLEASANT HILL, Ore. — For newer goat owner Marit Vike, Dairy Goat Day was an opportunity for her and her husband to learn more information about their animals — and celebrate their anniversary. Vike has had goats for four years, after her goat enthusiast friends inspired the couple to get their own. Although they consider the goats as pets and do little milking, Vike said she was most looking forward to health and pasture management seminars. Vike was one of more than 50 attendees at Dairy Goat Day, which was sponsored by Oregon State University Small Farmers Extension Program and Emerald Dairy Goat Association (EDGA) in Cottage Grove. Attendees traveled from around the Willamette Valley, as well as from Central and Southern Oregon and Washington. Last year, Lounsbury suggested to the association that they should host an educational day to “ramp up numbers for our nonprofit group and encourage 4-H kids.” She was inspired by the Northwest Oregon Dairy Goat Associations’ annual conference, and attended OSU’s goat education event. She said that the program puts out needs assessments and workshops to ask farmers what they need to know to work more efficiently. The seminar topics were chosen by EDGA and Small Farms Extension, and were geared toward both beginners and life long learners. “Our hope is that everyone, beginner or expert, can take away a few new pointers,” Lounsbury said. Seminars included: Adventures with Pack Goats, Common Diseases of Goats, Getting Started with Milk Certification, Cheese Making for the Home Dairy, Managing Internal Parasites, Livestock Guardian Animals, Raising Goats for Meat, Pasture Management, Finessing Freshening: The 123s of Milking, Herbal Goat Foundations and Handling Goat Emergencies the Herbal Way. Fery taught the general pasture management class. She said that “many Oregon pastures are overgrazed” and there are simple strategies to change that. She liked that it was applicable to people with goats as well as other livestock. Katherine Drovdahl, with Fir Meadow LLC, was another instructor. She taught both Herbal Goat Foundations and Handling Goat Emergencies the Herbal Way. She said she wanted attendees to start “thinking like a vitalist” and learn ways to handle simple and scary emergencies with herbal remedies. Lounsbury said she was excited about this year’s growth — double the attendance from last year — as well as the variety of different topics. Teagan Moran, OSU educational program assistant, said these collaborations happen when a need is identified. She said people have reached out to her before who have experience in milking but wanted to branch out to meat goats, and events like these connect the community to skill share and network. For Fery, after all the planning, she enjoyed watching attendees network and learn from each other.